Dundee's Peter MacDonald is among three strikers chasing PFA Scotland's Player of the Year prize in the Championship. 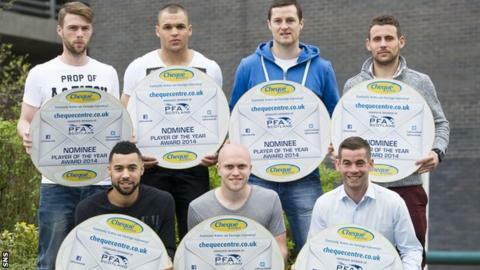 Kane Hemmings (Cowdenbeath) and Rory Loy (Falkirk), plus Hamilton midfielder Anthony Andreu, are also nominated. Ayr United forward Michael Moffat is up against Rangers trio Jon Daly, Nicky Law and Lee Wallace in League One. Peterhead duo Rory McAllister and Andy Rodgers vie for the League Two honour with Lee Currie (Berwick Rangers) and Kenny MacKay (Annan Athletic). McAllister, 26, is Scotland's leading scorer, and hit his 29th goal of the season at the weekend as the Blue Toon clinched the title. MacDonald is the oldest nominee at 33 and the former St Johnstone forward has knocked in 16 goals for Dundee, who lead the Championship. "It's so far so good this season, but it's not over as we have three massive games to go," said MacDonald. "We have an exciting run-in to say the least." Falkirk forward Loy, who has notched 19 league goals in the current campaign, paid tribute to his team-mates for his nomination. "Obviously as a striker you get judged on goals and I've managed to score a few. I know everyone says it but it's not just down to me, the boys behind me have been outstanding," he said. Moffat was punished with a four-game ban for breaching football betting rules in February but has not let that disrupt his good form, scoring six goals in five games since his return, taking his tally to 26. The winners will be announced and presented with their awards on 27 April. PFA Scotland chief executive Fraser Wishart said: "This is the top award for players. "There is no greater honour in football than to be voted the best player in your country by your fellow professionals."